Both the apostles Paul and Peter have a good deal to say about the character and tone of the “last days” prior to the Tribulation/Great Tribulation and physical return of our Lord and Savior, Jesus to this earth. Both men were gifted with prophetic voice that reaches all the way beyond us. By the Holy Spirit, they were given a sense of how trying and difficult times would be as the end approaches. In fact, during both their lives, they saw how bad things were getting then and were able to extrapolate to understand how much worse society as a whole would become as the days marched toward judgment. Paul admonishes the believers at Philippi (and us as well), that our character in the world should be above reproach. We should stand out like beacons or lighthouses, which more than adequately reflect the light of Christ. The gospel is to be shared not with words only, but by our deeds or our whole lives. This is truly difficult at times, isn’t it? In order to do this, we must constantly submit ourselves to the Father’s will, allowing Him to work in and through us for His glory. Any Christian who says this is easy may not be doing it correctly and should look closely at their lives and motivations, because the battle of wills – our will for God’s – seems constant. Paul understood that the generation he lived in then – roughly 2,000 years ago – was perverse and crooked. It was so because society in large measure rejected the truth of God in Christ. Like Paul, Peter and others who lived in a generation of people who were terribly crooked and perverse, we also, as Christians live in a generation that is possibly even more crooked and perverse. Because of technology that exists today, which did not exist 2,000 years ago, there is all sorts of spying, espionage, fallacious murmuring and more. Society has become increasingly licentious and even within the visible Church, we find alleged spiritual leaders advocating congregants to abandon critical thinking and give themselves over to the way they feel. Times of worship simply becomes a time when people are fully enamored by their feelings, which is done through a form of self-promotion and with an eye on self. 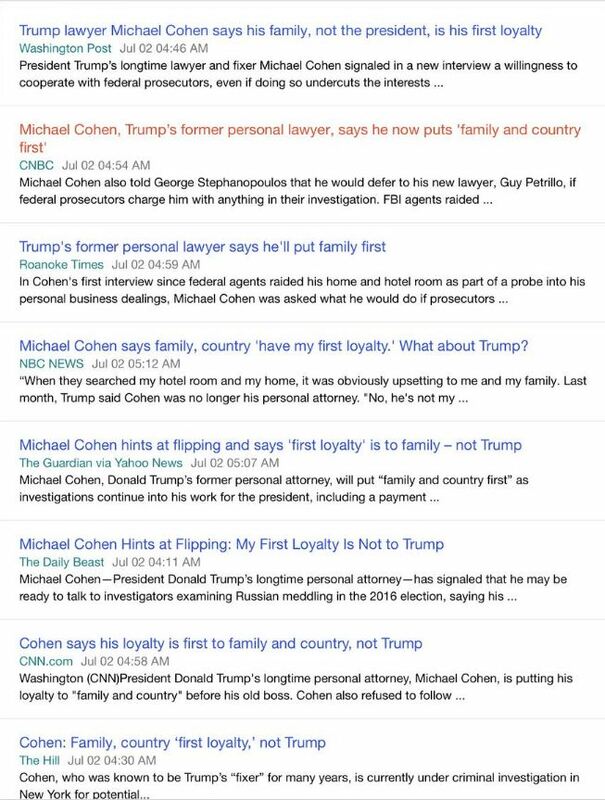 This image was posted by Q on July 3rd showing that many branches of MSM all have the same talking points. I have a feeling though that the loudmouths on the Left who are modern-day fascists, attempting every possible method to silence the opposition they see in conservatives, are few but very loud and vocal. They are ginning up the division mightily supported with dollars from wealthy people who live to stop President Trump. Tonight at 9:00pm EST, President Trump will announce his pick for the Supreme Court of the United States of America (SCOTUS) because of Justice Kennedy’s impending retirement. The Left including the MSM have already begun attacks on the people that they think Trump might nominate. I’m sure under Sen. Schumer and others in the Senate, plans are being made to do whatever they can to stop the nominee from becoming approved. We’re hearing all sorts of asinine statements by those on the Left including Trump’s alleged “war on women” and with this next SCOTUS pick, abortion will be eliminated as well as reproductive rights, etc. One thing the Left does well is to act like Chicken Little. For them, the sky is always falling yet not one thing they have warned about has actually happened. In fact, all the good things that have happened, we are told, will turn bad. It is becoming more common place for individuals on the Left to harass, bully, and even viciously physically attack people who support Trump and the rule of law in the United States. This is the actual definition of fascism (unless Google has changed it of course). It is using terror, intimidation and even violent tactics to shut down all opposition. As much as the Left likes to refer to conservatives as “Nazis,” the truth is that it was the Nazi brown shirts who used the exact same tactics being used by the Left (including AntiFa) today and the Left’s KKK also used those same tactics of intimidation decades ago against blacks and even members of the GOP. Black people were not the only ones lynched then. The Democrat KKK lynched anyone who stood in their way. It was the NRA who entered the picture and taught blacks and others how to shoot to save their lives. But today’s modern equivalent continues to be seen within the camp of the Left. But it isn’t just within the political spectrum that we see this type of chicanery, non-compliance, and obfuscation. We see it in the alleged “healthcare” industry as well. All of this together is creating a very perverse and crooked generation. Recently, a short video was making the rounds on the social networks. I’m not going to link to it but if your curiosity directs you, you can easily search and find it. In the video, several doctors are shown actually playing with dead babies, who had just been murdered through abortion. They treated these babies as though they were puppets. I have to wonder why someone filmed it unless it was done under cover by a nurse or someone else who wanted to shed light on the despicable actions of these two medical “professionals.” This kind of perversion proves several things. Either the doctors are completely heartless, which is not too difficult to imagine after killing hundreds if not thousands of unborn children for profit, or they’re feeling such guilt over it they have to treat the babies as though they are not human to assuage their own guilt, or both. Watching two grown adults play with two dead babies that they have just intentionally killed is beyond the pale. It is remarkable how low people can sink because of what society props up. Society is sinking and one can only wonder even if President Trump is able to make tremendous inroads against the corruption that exudes from Capitol Hill, how long can it possibly last? It seems that eventually, things will return to the way they are now and possibly worse. Dogs do return to their own vomit. 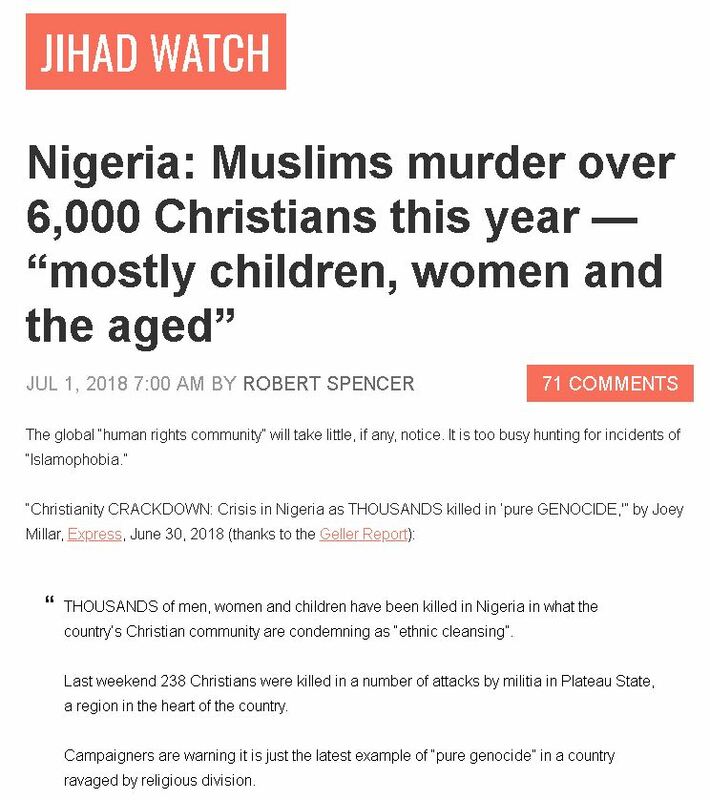 We also just learned that in Nigeria, 6,000 Christians have been murdered largely by Muslim factions. This is how Islam creates its caliphate. This is, I believe, also why world leaders are working so hard to bring “refugees” into civilized countries. Most of these refugees and not women and children, but young men. They often create havoc that the MSM fails to report on, either because they are suppressed by governments or because it is not aligned with their narrative. Sweden is almost completely lost as are numerous other foreign countries to marauding gangs of “refugees” who create all manner of havoc. Little is done even when they are arrested. Beyond this, the Bible clearly states that things will progressively worsen until the Tribulation/Great Tribulation becomes full-blown, ending only with the physical return of Jesus. There is no getting around this. I do not believe it, therefore I’m alleging making it happen. I believe it because God said it and therefore, it will happen because He will allow it to happen. Any Christian who does not admit that we live in a crooked and perverse generation is blind, uninformed, not actually saved, or quite possibly, all three. The Bible is exceedingly clear on this subject and God’s plan for how it will all work out. In spite of what President Trump manages to accomplish during his tenure as president – and I’m very grateful that he is our president now – eventually, things will turn south again, the world will become one and will do everything possible to throw off the chains of God’s rule over this earth (Psalm 2). In the meantime, we see the corruption daily. It is sickening and appalling that people are so blind by their hatred they cannot see the truth. It reminds me of people I have talked to on more than one occasion expressing their need for salvation. I’ve explained what the Bible says. I’ve tried to help them understand the reason they are in need of salvation in the first place. I then explained that becoming a Christian does not mean saying a few magic words or trying to do what Jesus did when He lived on this earth (the friend attends a Unitarian-Universalist Church). It is becoming a new creation in Christ, what Jesus called being “born again” or “born from above” (John 3). When this spiritual transaction occurs through faith – believing that Jesus is who He said He is and accomplished for us what we could not accomplish or ourselves – my unrighteousness is fully removed from me and in its place, the perfect righteousness of Jesus is literally imputed (given fully and freely) to my account. From that point on, though I am still a sinner, God sees Christ’s righteousness attached to my account and I become “blameless” before Him. Yes, I can still sin, which requires my confession in order to continue to be in fellowship with God, but I can never lose my salvation because that righteousness that is imputed to my account from Jesus is permanent. In spite of this and other explanations and even though our friend has no response to that, she continues to resist God’s grace. Pray for her please. God knows who she is. We truly live in a dark, perverse and crooked generation. The Bible promises that it will get worse, not better. There may be a respite under Trump, but it’s guaranteed not to last according to the truth of Scripture. I cannot say this strongly enough. Read your Bible daily. Pray. Talk with God throughout the day. This is how we draw close to Him. It is how we move to the center of His will and stay there. God wants us near Him. I’ve lost count of how many Christians will say they don’t “have time” to read God’s Word but they’ll reach for a devotional book. Do both and if you cannot do both, choose His Word. Do you want to go into His Presence telling Him that you didn’t have time to read the Bible every day when you know that’s a lie? The best weapon against a perverse generation is personal and intimate knowledge of God, which happens only through the study of His Word. There are no shortcuts. Entry filed under: 9/11, Agenda 21, Atheism and religion, christianity, Communism, Cultural Marxism, Demonic, devil worship, Emotional virtue, eternity, Global Elite, Islam, Islamofascism, Life in America, Political Correctness, Politically Correct, Politics, Radical Islam, Religious - Christian - End Times, Religious - Christian - Prophecy, Religious - Christian - Theology, salvation, Satanism, second coming, Shadow Government. Tags: crooked and perverse. I love reading your emails and this last one says that you can’t stress enough to read the bible and pray often. I would love to commit to reading my bible, but I have to admit, it is just so daunting to me and confusing and seems out of order and I just don’t know where to start and keep it interesting for me. I used to own a bible called “The Book” and it was so much easier to read and understand, I moved a few times and now I don’t have a clue where it is! What do you suggest for trying to commit and understand and stay interested? Another concern of mine is that all current versions have been greatly bastardized to suit different religions and kings, what is the most accurate version that you can steer me towards, I want my time to be well used on the real words of our Lord, not the words of some crooked mortal! Thanks for commenting and for your questions. I can relate. First up, I use MANTIS Bible Software on my phone because through it, I can download numerous Bible versions, commentaries, maps, and other important research. There are many quality Bible software programs for computers and phones. It’s put together by James H. Price and it tells you what needs to be read daily and allows you to “check” things off. In this way, it keeps track of how much you’ve read through the entire Bible. Right now, I’ve read over 55% of the entire Bible. I’m not sure where you’ve heard that the Bible versions are all bastardized. In fact, if we line up all the good translations and compare them, you’ll find one HALF of one page of Bible text’s worth of differences and NOTHING to do with any major doctrines. The mistake people often make when trying to determine the “best” English translation is when they compare one translation to another in English. This is wrong. In order to determine the best translation, each translation must be compared to the original Hebrew, Aramaic, and Greek. Each translation might be different because one version is a word-for-word translation, while another is a thought-for-thought translation. Still others are paragraph for paragraph translations (better known as paraphrases). In other words, there are many very good translations. Some have chosen one in particular, which they believe was “secondarily” inspired by God Himself. As far as we know, the original autographs written by the original human authors do not exist nor have existed for quite some time. Even if we had some original manuscripts that came from the hands of the original human author, we would not be able to verify that fact. I use The English Standard Version (ESV), but not exclusively. There are many good translations out there, like the New American Standard, the New King James Version and others. What you want to look for is a translation that says “word-for-word” translation, not thought-for-thought. However, when I read the Scriptures (usually in the morning at about the same time each day), I use the ESV because I like how the English moves along smoothly. That said, in my phone I have access to other translations that I can call up with a few clicks to compare or flesh out meaning of certain passages. When I read the Bible each day, this is for my devotions. I try to remember one or two things from that reading to carry with me during the day. But that is not the only time I study the Bible. Other times, I will focus on an entire book. For instance, I am now once again starting to read and study through the book of Zechariah because I’ve been asked to teach through that book for an upcoming adult Sunday school class at my church. I also have access to Constable’s Notes in my MANTIS Bible app (for a small cost), so as I’m reading each morning, if there is something that confuses me, I can pull up his notes for clarity. The late Dr. J. Vernon McGee is also a very good commentator and has written commentaries on every book (I believe) of the Bible. The Bible should be read daily. We should spend time reflecting on what we are reading and even take it to the Lord in prayer. He will also elucidate our thinking. Get a good quality, word-for-word translation and start there. Also get some good commentaries. Most commentaries fall either into the “devotional” or “academic” areas. In other words, a devoitonal commentary often helps Christians understand how the truth of Scripture can be applied to our lives. Academic commentaries can do that as well but quite often will go deep into the languages, which may give you much more than you will benefit from now. Start with a good Bible reading program that will get you through the Bible in a year. I read my Bible starting on January 1st, from Genesis 1:1 to the last verse of Revelation 22 by December 30th. Then I start over again on January 1st of the new year. What you will learn is how much starts to sink in the more you read it. When you first start, it will probably seem very boring and tedious to you (but maybe not). As you persevere, you’re developing a habit that will be difficult to unmake. The longer you read through the Bible, the more you will remember. One of the biggest problems is when people miss a day or two. They’ll often give up because they don’t feel they can get caught up having failed to read five to 10 chapters. If that happens, then just start again on that particular day you get back to reading so that you are on track. Sure, you can go back and read what you missed (I’ve had to do that), but if time doesn’t permit, then go to the day you are on and read from there. I guarantee that this will become a lifelong habit of reading God’s Word. You won’t grasp everything for every day that you read. Don’t beat yourself up on that. You need to simply read. The Holy Spirit will quicken it to you and you will eventually not like missing a day. You will start putting the pieces all together.